Had to share this recipe because the icing is amazing! We are not cake eaters in our household but with this recipe, everyone wanted a cupcake. Honestly, I would rather have apple pie but this icing is the best and the cake is super moist. The two together makes the best cake and you can make in any flavor (The recipe below is for chocolate cake but I used lemon cake mix, lemon pudding and white chips for the cake and added lemon rind and fresh lemon juice to the icing. 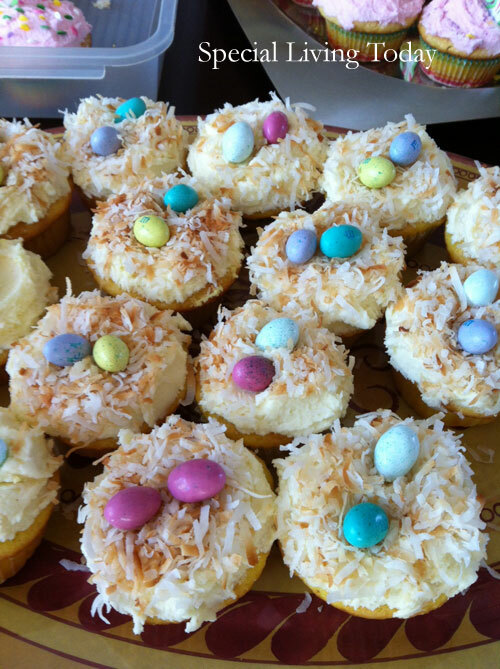 We then added toasted coconut and chocolate eggs to the top). I wanted to post this because my daughter Birkley loves to eat icing if it’s good. If it’s too sweet, she will definitely give you a bad face. Love this icing because it is super fluffy and delicious and something Birkley can enjoy eating while I bake. I received this recipe from a friend who bakes amazing recipes and the best part is, it’s super easy. It’s super low fat, ok not at all, so don’t make this if watching what you eat. In a large bowl, combine sugar, shortening, water and vanilla. Beat on low speed to combine, then beat on medium speed for a full five minutes. It won’t look like icing at first, but keep the mixer going for a full five minutes, and then you’re done! Notes: You may use half shortening and half unsalted butter. If you’re not using this for decorating, but just for icing the cake, thin the icing by adding the corn syrup or water to the icing. Mix all ingredients except chocolate chips in mixer or with whisk. Add chocolate chips after everything else is combined.